May. 13, 2010 · 7:09 a.m.
Apr. 30, 2010 · 2:11 p.m.
Apr. 29, 2010 · 12:59 p.m.
About 50 Ypsilanti Township residents gave the Washtenaw County Sheriff Office their input about law enforcement in the community Tuesday evening. Apr. 20, 2010 · 2:20 a.m.
Ypsilanti has many faces, and Erica Hampton wants to share a few of them with you. Apr. 17, 2010 · 2:38 p.m.
Ypsilanti's newest concert venue is preparing for its grand opening weekend April 23, more than a month after its soft opening March 13. All the proceeds of the book sales for "Daily Bread" will benefit both the Lenawee Daily Bread soup kitchen and the Shelter Association of Washtenaw County. 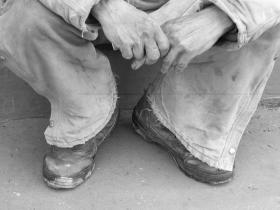 Sep. 12, 2009 · 11:58 a.m.
Homelessness has been a serious issue in America for what seems like forever. But hearing about homelessness and seeing it are two different things that bring out two totally different emotions. Writer Jeniffer Burd hopes to touch hearts and open the minds of people about this growing population of homelessness in two areas of Michigan at her reception at the Shankwiler 123 Gallery on Saturday where her book, Daily Bread will be on sale. All the proceeds of the book will benefit both the Lenawee Daily Bread soup kitchen and the Shelter Association of Washtenaw County. The book, which is composed of photographs and lyrical prose poems, came together after Burd was given an assignment when working as a reporter for the Daily Telegram in Adrian. Burd was so captivated by their interesting stories told by the many she interviewed, she realized she had so much information that couldn’t all be shared in one newspaper story. Instead of just disregarding it, Burd felt obligated to share the information with the world. That’s when Burd began to speak with Lad Strayer, a photographer who also worked with Burd at the Daily Telegram in Adrian. Strayer had already begun taking photos of homeless men and women also at Daily Bread soup kitchen prior to Burd’s story. After thinking about how both of their work could amount to something beneficial to the people they interviewed and the public, Strayer decided to put together an exhibit at Adrian College that displayed both Strayer’s photographs and Burd’s poems on sound boards. “We just thought that this presentation in a way hit home more about homelessness.” Burd said. “It hit home more than all of those newspaper articles I did because it hit more on an emotional level and a more personal level and its important for people to read it and that’s why we published it,” she said. For those who visit the reception and aren’t able to buy a book, Michelle Shankwiler, owner of Shankwiler 123 Gallery, are making a donation box available where all proceeds will also go to the Daily Bread soup kitchen and the Shelter Association of Washtenaw County. The reception will be held at 5- 7 p.m. at the Shankwiler 123 Gallery, located at 35 E. Cross St. For more information, call the gallery at 734.487.9150.